How do we find, train, and then keep good staff? How can we create an environment in which children can learn, play, and be safe? How can we market our services to the community? How can we differentiate from the crowded marketplace? How do we help parents, and involve parents, with difficult work schedules? None of these challenges can be ignored, and all of them require the dedication of time and resources if they are to be solved. Don’t struggle with these challenges and don’t try to reinvent the wheel. Gurus micro franchise option will answer most of these questions for you. As you begin to consider, how you will differentiate your after-school program in a crowded marketplace, it is very important to consider the type of after-school program you will launch. Gurus programs have a clear roadmap and well-defined curriculum. Parents appreciate how these programs provide the necessary social and academic life-skills for their children. With Gurus micro franchise, you and your staff get training on the programs as many times as you want, at no additional cost. You have access to many resources to provide a fun and engaging well-structured program. When the staff is trained, and well-supported they are happy and stick to the workplace. Gurus micro franchise provides you an excellent platform to market your program and center. Your classes are listed on the Gurus main website for parents to navigate and register. You are also listed as our prestige partner on our brochures, website and other places, increasing the exposure of your center. It can be a great value-add if you have or don’t have your own website. 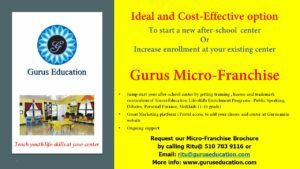 Gurus Micro Franchise gives you access to curriculum, unlimited training, a great marketing platform, technical, registration and customer service support for enrichment programs in Public Speaking Debates, Personal Finance and Medi-Kids for 1-10 grade students. ← How to decide which are the right after-school classes for your child?